Opticonx Xtreme Uniboot Polarity Switchable Patch Cords feature the ability to change polarity in the field without tools and now include push/pull tabs for easy access and better identification. How many fiber connectors have been broken moving patch cords in a crowded patch panel? Are you concerned about using a screwdriver or pliers around active fiber connections? 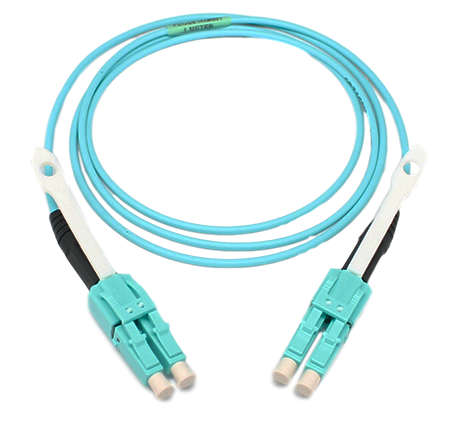 Opticonx Xtreme Uniboot Polarity Switchable Patch Cords feature the ability to change polarity in the field without tools and now include push/pull tabs. Push/pull tabs allow for easy access in crowded equipment and patch panels environments. The tabs can be labeled for easier identification. Xtreme Uniboot Patch Cords feature high density, small form factor LC connectors mated to 2.0mm round duplex cable. They are used to connect switches or network devices in fiber networks directly or interconnect structured cabling systems in a fiber network or a data center. Polarity changes can be made in the field quickly, without the use of tools, to the correct fiber mapping polarity. All Opticonx products are made in the USA. Opticonx - fiber cabling experts specializing in data centers. All products are designed and manufactured in Putnam, CT.